This book of reflection, focus and contemplation is designed to stimulate the reader to continually ask questions and find answers. The book has been created with a very powerful intention. The sentences and thoughts have been constructed in such a way that they contain many subtle layers of possibility. The heritage of words which inspire can teach us to observe and know the soul striving to find ways to claim the truth of our own Being. In the foreword The Hon. Michael Kirby, formally a Justice of the High Court of Australia writes: “Each one of us, as a spark of life, is on an individual journey. Words, which are only the skin of ideas, transmitted from one intelligence to another, have a different impact on each one of us. Reflecting on the unique capacity of the human species to transfer complex concepts and information from the unpromising physical cells of one brain to another, it is truly amazing that we can find help and solace by occasionally concentrating on words and sentences. And then translating them into the realities of our own unique lives. 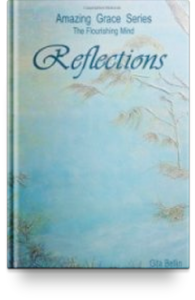 Accompanying this book is a powerful Reflection exercise which may be downloaded. Readers interested in developing inner awareness will appreciate the book’s message, which provides a good foundation for the next book in the Amazing Grace series, which focuses on compassion. Purchasing the book and the recording together would help the reader.